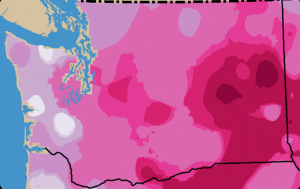 In the report below, we describe the methods used to develop our fine-scale climate change projections, summarize projected future climatic conditions for Washington, and then evaluate the utility of the downscaled data for connectivity conservation planning. Finally, we discuss the potential utility of projections obtained from “downstream” impacts models (models that translate climate changes to changes in other variables, e.g., fire severity). Downscaled climate dataset available for download here.